To make sure that you return from trekking in the Himalayas in Nepal with a lot of happy and unforgettable memories, it is vital that you’re aware of the altitude acclimatization required by the human body in mountain conditions. By observing a tried and tested altitude acclimatization regime about which I’ll tell you below, you’ll succeed in avoiding altitude sickness which can not only provide you with unpleasant moments, but could also force you to change your trekking plans. The most important precondition and best way of avoiding altitude sickness whilst trekking in Nepal is to increase altitude gradually and systematically. In Nepal a safe altitude to which you can climb rapidly and straight away is: 2,700 – 3000 metres. The most popular mountain airports in Nepal are located in this altitude range: Lukla and Jomsom. On the day of your arrival, you must definitely spend the night at the same altitude. 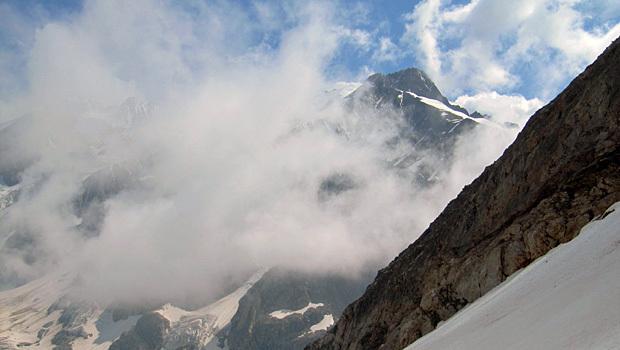 Thereafter you must stick to a set climbing regime: 300 – 400 altitude metres a day. Accordingly, every overnight stay must be at an altitude of 300 – 400 metres higher than your previous overnight accommodation. Having climbed a total of 1,000 altitude metres, you must devote one whole day to altitude acclimatization and stay overnight at the same altitude. It is advisable to spend the day of altitude acclimatization doing a little trekking leading up to a short stay at a greater altitude (300 – 400 m) before returning and staying overnight at the previous altitude. In Nepal, you will not find it possible to stick to exactly this climbing regime on all trekking routes in the Himalayas, therefore altitude acclimatization days are individually planned for each trekking route. In the mountains, atmospheric pressure falls as the altitude above sea level increases and this affects your body. Therefore, when trekking in the mountains it’s very important to consume a lot of liquids by drinking lots of tea, juice, soup and clean water. You should drink at least 3 -4 litres of liquid a day. You can buy a litre of bottled water in teahouses along all the most popular trekking routes in Nepal. You should avoid drinking too much black tea while trekking, as well as giving coffee a miss on tough days, because these drinks can induce heart palpitations and create additional pressure on your heart. When trekking in the mountains, particularly during your ascent you must categorically avoid the use of alcoholic drinks and sedatives or sleeping pills. Like smoking, sedatives artificially reduce the flow of oxygen to the brain, particularly in mountain conditions in which the concentration of oxygen is already reduced. In turn, alcohol has the heightened effect of depriving the body of water or dehydrating it which is a similarly undesirable process when trekking in the Himalayas in Nepal. Mountain medicine has discovered a range of medicinal products that improve the altitude acclimatization process and reduce the side effects of altitude acclimatization in the mountains such as sleepless nights. These products are widely used by trekkers on popular trekking routes in Nepal like the Everest Base Camp trek, Gokyo trek, Annapurna Circuit trek, etc. In traditional medicine, Acetazolamide is also used to treat epilepsy and glaucoma. Studies of the effectiveness of Ginkgo biloba extract during the altitude acclimatization process and of its impact in mountain conditions are still continuing, but experiments have shown that it is effective in helping to reduce symptoms of altitude sickness during trekking. Ginkgo biloba functions as an antioxidant, reducing stress and the supply of oxygen to the brain. It is recommended that you start using Ginkgo biloba extract at least five days before climbing in doses of 80 – 120 mg twice a day and that you continue using it in the mountains. Ginkgo biloba extract is a natural product made from ginseng and may be used for prophylactic purposes to improve the functioning of the brain and not just in mountain conditions. It can be bought in pharmacies as a nutritional supplement without prescription. Bearing in mind the physical strain and changes in mountain conditions, whilst trekking you would be well advised to avoid overexertion and leave the carrying of your heavy bags to bearers. This doesn’t cost much and you can a hire a Sherpa to carry your bags on almost any stage of the Everest Base Camp trek starting from Lukla right through to Pheriche or Dingboche. If you still plan to carry your own rucksack; optimally its weight should not exceed: 10 -12 kg. You should always take a guide with you when trekking in the mountains. Altitude sickness symptoms can induce panic or wild behaviour so you must have somebody alongside you who can help you at any time you find yourself in trouble. Typically, altitude sickness symptoms get worse at night due to problems acclimatizing to the new altitude reached during the day. If symptoms of altitude sickness force you to depart and descend at night, you simply must have your guide with you at all times! If, after reaching a new altitude on your trekking route, you begin to experience mild symptoms of altitude sickness, you must not climb higher under any circumstances! You must remain at your current altitude and monitor your symptoms. Usually altitude sickness symptoms begin to appear 6 -12 hours after reaching a new altitude. Symptoms start appearing in the form of a mild headache which may disappear in a few hours, or, on the contrary, get worse, accompanied by panic, loss of appetite and nausea. Trying to fall asleep you experience wild dreams and mild hallucinations. During this period, even though you’ve lost your appetite, it’s very important to drink a lot of fluids and to eat, if you haven’t already done so. Garlic soup is recommended as well as Diamox or some headache tablets which liquefy blood and improve blood flow: Paracetamol, Aspirin, Tylenol or Ibumetin. A real example of inadequate altitude acclimatization was that which I personally experienced during my Everest Base Camp trek. The first altitude acclimatization day (a rest day usually occurs at Namche Bazaar, but we skipped it and next day continued climbing to stay overnight at Khumjung (3870 m) which is 400 m higher than Namche Bazaar. We completed that day’s trekking at about 16:00 and stopped at a Khumjung teahouse. Gradually I began to feel a light all-encompassing pressure at the top of my head which left me feeling as if I was wearing a swimming cap. Gradually the pain grew stronger in my forehead, but at about 22:00 when I was getting ready to fall asleep, I was overcome by a feeling of alarm that I’d never felt before and a slight case of nausea. It was as if I was short of air. I took some Diamox, drank a lot of fluids and headed to the teahouse’s big bedroom to sleep, because it was cooler there. I struggled with sleeplessness and nightmares for another few hours and only fell asleep towards morning. The next day I ate breakfast and felt a lot better again. We continued trekking because the planned altitude regime along the route favoured the continued altitude acclimatization process. It was a mistake to climb higher without a full day’s altitude acclimatization at Namche Bazaar. If the usual painkillers used to treat headaches (Aspirin, Tylenol, Ibumetin, etc.) don’t help and your headache doesn’t pass, this indicates that the altitude sickness is getting worse. In the event that upon reaching a new altitude along the trekking route the symptoms of altitude sickness don’t pass and get worse; the most effective treatment is to descend without delay to a lower altitude. You must descend without delay even at night. You must be accompanied by your guide and take everything with you that you need for the journey. Under no circumstances should you descend alone. At the Himalayas Khumbu region Machermo HRA Medical Point, I heard a story about a a trekker who died at night after falling into a gulley from a narrow or icy hill path whilst suffering from altitude sickness resulting in a loss of balance and sense of disorientation. In such circumstances you should reduce your altitude to at least the altitude at which you made your previous overnight stay where you didn’t notice any signs of altitude sickness and, if possible; descend even lower. You will feel the benefits after reducing your altitude by 500 – 1,000 altitude metres. You should use medicines, additional oxygen and your compression bag or Gamow Bag if you have them available. Never leave a person showing signs of altitude sickness alone. He could begin to experience rapidly deteriorating altitude sickness symptoms and it may be necessary to urgently evacuate him to a lower place. You should keep warm at all times when trekking and prevent your body from cooling, particularly during the first stage of altitude acclimatization. Check to make sure that your clothing is always dry. In the mountains the air is dry and it’s usually windy. As sweat evaporates, it increasingly cools the body, narrowing arteries and reducing the supply of blood and oxygen reaching your organs, thus creating conducive conditions for altitude sickness to get worse. Special technical clothing has been invented for trekking in the mountains, which ensures that the body breathes and gets rid of sweat as effectively as possible. By observing all of these rules, trekking in Nepal, especially the Everest Base Camp trek will be a fun experience and you’ll arrive home with fantastic memories and impressions of your time in Nepal and the Himalayas. If you have any specific questions about altitude acclimatization along Nepal’s trekking routes, please feel free to write to me and I’ll get back to you as soon as I can. All that i read above is very informative, Thanks!! Me and a friend are planning the everest base camp trek in March 2012. I am sure all this information will be really helpful. Hey, thank you for helpful information. I am climbing Kili in January 2012. It will be my first mountain climb. In my country it is impossible to buy Diamox but they sell Diacarb (Azetazolamide) 250 mg each tablet. As per your info, I understand that it is the same. Our drug-store assistants have no clue about altitude treatment as we have no mountains. I am very glad that I have read this important information before my climb.